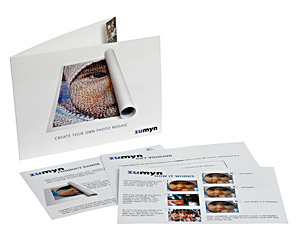 A gift voucher means that you can give the gift of a photo mosaic, and the recipient can use their own photo collection to create it. Vouchers are available for any product in our range and their price includes shipping the mosaic to the gift recipients location. Vouchers can be used as part payment against a more expensive product. So, if you buy a voucher for a standard canvas and the recipient would like a large canvas, they only need to pay the price difference between the two. Vouchers can be provided digitally free of charge, or alternatively for a small delivery cost, we can send out a voucher pack like that shown on the left.